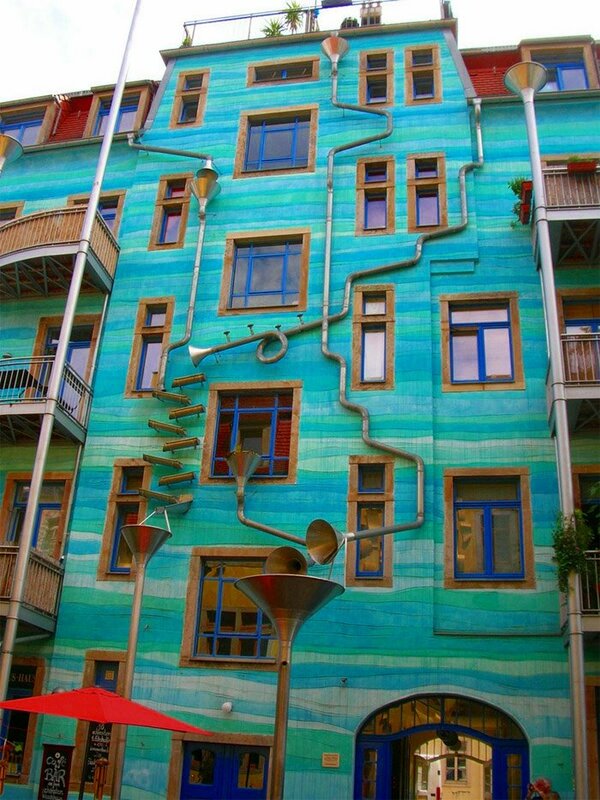 I wonder if this building was created by Dr Suess…. If not Seuss, then certainly someone with the same sense of humor and creativity! LOL! Ayup! I love it. I want to go drop some balls down those tubes. It sure looks like it could be. Cool! 🙂 And with that whimsical image in my head, I’m now headed off to bed. Goodnight my friend. Gnite. Sweet dreams. Don’t let the bedbugs bite (literally). Oh, bouncing around the internet. I think that may have come off of Pinterest. Rube Goldberg fanatic. I wonder if this is the process of getting the mail into the mail box . . .
Love Rube! I’m a Purdue grad… the famous Rube Goldberg contest!!! Ohh I’d love to see a shot or video when it’s raining! That would be great! I want to drop balls down the tubes. Drop balls down them during the day not to wake sleep residents. Cool and fun building that also could be inspired by the game “Mouse Trap”. That is true! That was my most favorite game as a child. Looks like a fun place to live or at least hang out. Yes it does. I’m willing to bet they have a nice sized waiting list for either renters, or purchasers if they’re condos.